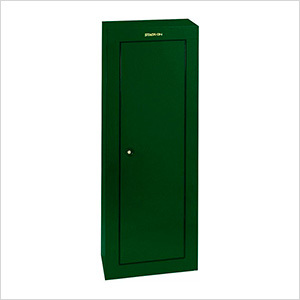 The Stack-On 8 gun steel security cabinet (hunter green) protects your firearms and valuables against theft. This all steel security cabinet can hold up to 8 long guns and has been tested and verified to meet the California Department of Justice's standards as a fire arm safety device. Additional storage is available for storing ammo, pistols or other small items by utilizing the removable shelf which is included with the cabinet.